Your child might be fast for his age, but nothing can prepare him for the superhuman challenge of breaking landspeed records. 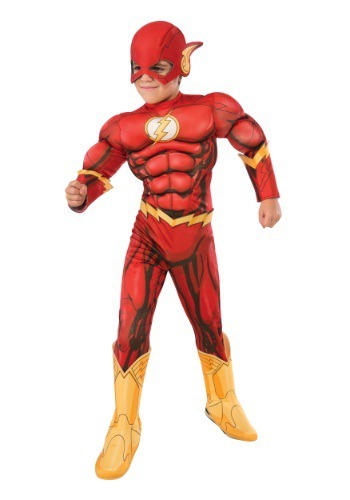 Nothing, that is, except an awesome Deluxe Child Flash Costume like this! Because there's little you can do to hasten the moment that your kid will be able to reach the pedals of an experimental rocket-powered hypercar, but this suit offers a shortcut to inspiration by simulating the athletic physique of our favorite DC speedster. And there's no greater power than being able to set goals and work hard to achieve them, so we think the best course of action is to develop his innate talents, along with any that he may be granted by lab accidents or impurities in the water supply. Okay, we're not trying to advocate for exposing anybody to dangerous chemicals. We're just saying that you can't solve all your problems by sticking rockets to things, so it's best to break that habit as early as possible! We've tried that approach, and we're still trying to buff the scorch marks out of the floors of our office. Sure, everybody's memos circulated a lot more quickly, and they attracted way more attention than before. But at what cost? Ballistic staplers, in particular, turned out to be way less fun than they sounded! Take our advice: give the safe soft-sculpted details of this sweet scarlet suit a chance. If jet propulsion still seems like a good idea by this time next year, we'll begin the countdown ourselves!